As a proudly Australian company, Ashdene is often inspired by the majesty of our Australian landscape, and our own very unique sights and attractions. Now, Ashdene has captured the rich history of our great southern land in their new Dreamtime Creations collection. 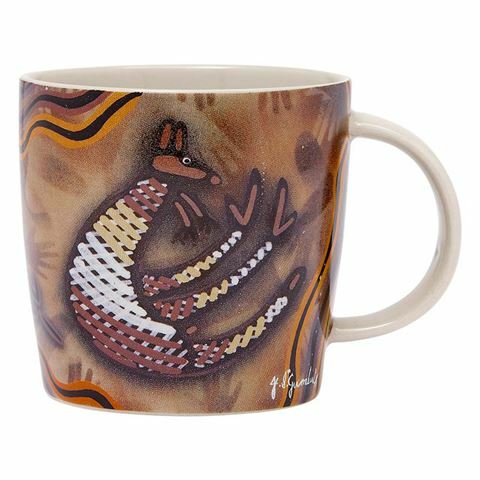 Conceived by artist John Smith Gumbula, the Dreamtime Creations range focuses on the various native animals of Australia and how these creatures have carried an important and ancient spiritual connection to the Aboriginal people and the land for over 60000 years. Designed by John Smith Gumbula. Features an indigenous artwork of a kangaroo. Includes several faint hands in the background, signifying man’s connection to the land. Beautifully presented in an Ashdene gift box.